A –Streams of Thought– contribution by Kevin Roche. 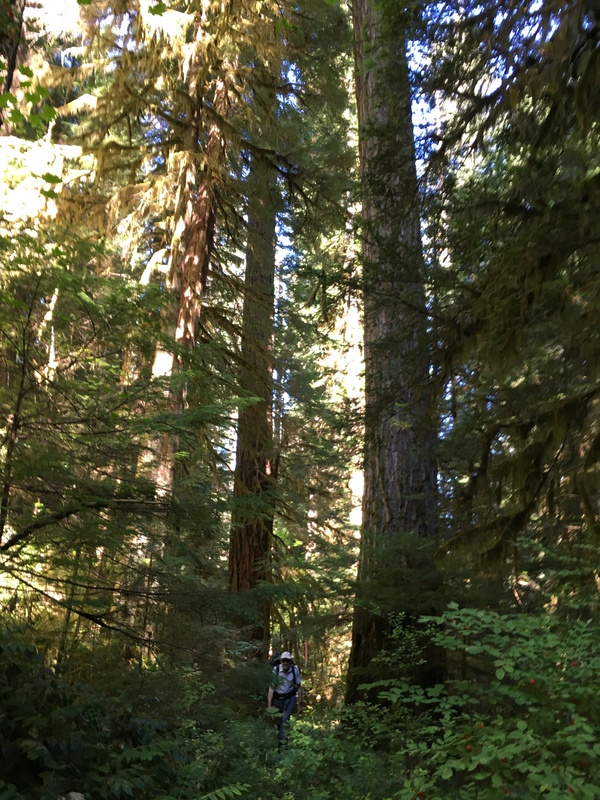 Steven Wondzell is a Research Aquatic Ecologist at the Pacific Northwest Research Station of the US Forest Service. 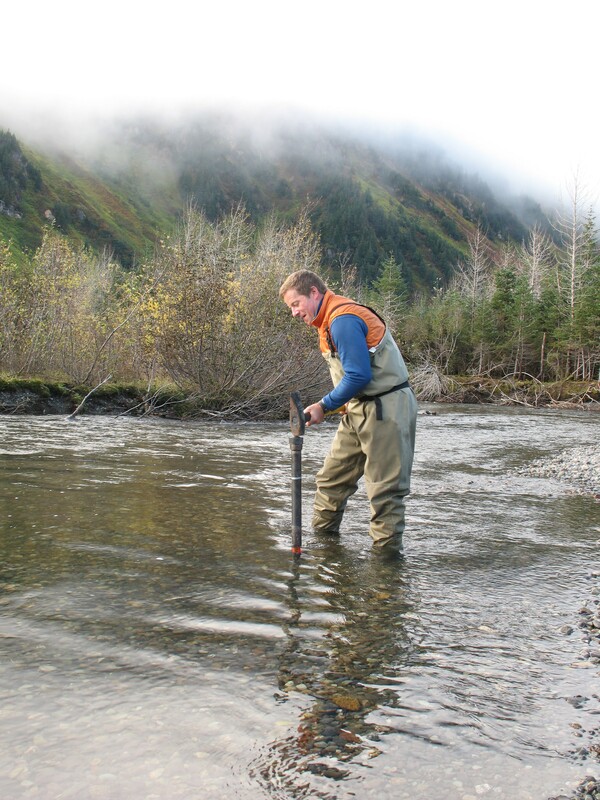 Dr. Wondzell’s research explores the hydrological and biogeochemical linkage between surface waters and groundwaters in high mountain streams. The geographic focus of this work is the HJ Andrews (HJA) experimental forest in Oregon’s Western Cascade Mountains. This Long Term Ecological Research Station (LTER) has served as both the birthplace and the proving ground for many hydrological theories in the last 40 years, and novel understanding continues to emerge from within its boundaries. I had the pleasure to sit down with Dr. Wondzell just steps from the HJA headquarters. KR: You are the first Hallway Conversations interviewee to have focused so intensely on a specific geographic setting for multiple decades. How did you become involved with the HJ Andrews? SW: I have a checkered past. I went to college in New Mexico and got my undergrad degree in range science, which dealt with managing natural pastures for cows in Western North America. I then got a Masters degree in plant and community ecology, and I ended up working on the Jornada LTER, where I got really interested in the soil processes and geomorphology. [Geologist/Geomorphologist] Fred Swanson, who was then working at the Andrews, came to the Jornada for a visit. None of the PIs or other people on the project were available to take Fred to the field, so I did. We spent this absolutely fantastic day looking at desert geomorphology, with him telling me about the Andrews as this spectacular place. He invited me to come up here to work on a Ph. D., and I arrived about a year later. Fred’s a really interesting guy. I had what was probably the best possible way to do a Ph.D., albeit a very stressful one. The forest service has a library of data collected and papers written just about the HJA. During my first quarter at [Oregon State University], Fred pointed me to that library and said, “There’s the forest. Figure out a project.” So I did. The first three months, I’d spend 3-4 days out here each week. In the evenings I would read science papers across a full range of disciplines—aquatic, terrestrial, geologic, geomorphologic—and then I’d go out, hike in the forest, and look around. KR: What did those walks and hours in the library evolve into as a Ph.D. thesis? SW: When I was out in the desert I got really interested in geomorphologic process: processes that could transport materials through the landscape. At the same time I was doing a lot of ecological reading, and I was really influenced by [the work of D.L. Correll] down in Chesapeake bay landscapes, looking at riparian buffers as mechanisms to limit the movement of nutrients from agricultural fields into streams. So there’s this physical mechanism to transport nutrients and kind of an ecological relationship –in today’s terms we would call it an ecohydrological relationship—that would control the transport. I thought, well how does this work in a forested ecosystem where we have these big riparian zones? And how do forest ecosystems interact with these big riparian zones to control the nutrients and other biogeochemical products that make their way off of the hillslopes and eventually out of the watershed? So it was kind of blending this interest in geormorphology from the desert with research that had been done in eastern landscapes looking at riparian buffers, and trying to think about the world in a mechanistic way as water’s moving around. I sort of blended them together here at the Andrews and ended up looking at water flow through riparian systems and how that influences the nitrogen budget of a stream. KR: Were any of these critical questions answered? SW: Maybe I was (1) incredibly poorly prepared to do a Ph.D. project, and (2) incredibly naïve; but I ended up taking on a project that any reasonable advisor would have said, “No, that’s way too big and you really shouldn’t do that.” I didn’t even know the word hyporheic existed, and I didn’t even know there was a hyporheic zone. I had a really simple conceptual model—that the water would flow off the hillslopes and across the floodplains and into the stream—and I wanted to sample water along that flowpath. I put some wells in along the width of the floodplain, and by the end of the summer I had them installed. I surveyed them, measured the depths to water, and I found that over half the width of the floodplain the water was flowing the wrong way. It was flowing from the stream into the floodplain, and I just knew that could not be. By then the whole field of hyporheic research had already gotten underway, but it was pretty young. I did a keyword search for the number of papers that had the word hyporheic in the title, abstract, or main text, and at the time I started my Ph.D. there were a couple dozen. …so this was right at the beginning of hyporheic literature. I kind of got funneled into that and realized my conceptual model about how water flows is all wrong; but that basic conceptual model persists today. For many hydrologists it doesn’t, but somehow this idea that the water flows off the hillslopes, over the floodplains and into the streams is deeply entrenched in the field, outside a number of specialists that are paying attention to it. In the beginning we were trying to figure out the factors controlling the direction that the water flowed. As I dug in I found this thing that didn’t make sense to me. How can water flow backwards? It’s been a 20-30 year investigation into why does the water flows backwards (Wondzell, 2015). KR: Despite the explosion of research in the field, we still have oversimplified views of hyporheic exchange that hydrologists and ecologists sometimes use to a fault. We treat the hyporheic zone as a big, well-mixed reservoir, or we model streambed geometry as a series of sinusoidal bedforms composed of homogeneous sediments. How do the high-gradient streams at HJA break these conceptual models, and what is a more appropriate conceptual model in this setting? SW: …people come at the hyporheic exchange problem from two different [sets of experiences]. There are people who work in relatively low-gradient, mesic systems characterized by relatively fine-grained sediment. Stream channel gradients might be under 1%, so the lateral gradients to the stream might be as steep as the longitudinal gradients along the valley. Now on the other side there are people working in mountain systems with super steep stream channels, up to 14-15% surface gradients. Conceptual models that are developed in low gradient stream are really, really different than high gradient mountain stream systems, where much of the exchange between the steam and the subsurface is controlled by the physical profile of the stream—both the vertical profile as it goes over steps, pools and riffles, or a lateral profile as it interacts w/ back channels and secondary channels… It seems that people—and I’m no exception—get conditioned strongly by the systems we work in, so our conceptual model embraces the systems we work in. We haven’t had enough people working across a range of stream types, gradients, and conditions so that we begin to answer the question, “Under what range of conditions does this conceptual model apply, and where does that one apply, and where does neither of them work well?” It’s not a question of one being right or wrong, it’s trying to understand how the different factors that control hyporheic exchange are arrayed across the stream network writ large from mountain headwaters down to low-gradient lowland streams… We haven’t as a community built that kind of synthetic understanding (Wondzell, 2015). KR: Much of your recent research has involved carbon fluxes in streams (Zarnetske et al., 2012; Argerich et al., 2016). Has the geologic/ecologic setting of the HJA also challenged the common conceptual models that are developed or well known for carbon transport? SW: I think some of the initial ideas behind doing this carbon work would have, in many ways, confirmed things that we would have expected: how important streams are for exporting carbon from watersheds, for example. As you dig into anything with some fixed suite of expectations, you always find things that don’t quite fit. [Past research has shown] that the microbial metabolism of the hyporheic zone was dominated by the carbon that’s present in the stream water. So we started looking at the role of the organic carbon (OC) along these hyporheic flow paths through our well network. The first thing we found out was that the OC dissolved in the stream water can only account for about 10% of the total CO2 that accumulates along the flowpaths. Clearly the hyporheic metabolism here is not being driven by what’s present in the stream water, so it forces us to take a different look and ask, what’s the source of the OC that’s fueling this metabolism? KR: What advice would you give for new and aspiring hydrologists? SW: Persistence and passion. In many ways, [academia is] a super hard career choice. Maybe some people get lucky and waltz through grad school and right into jobs, and never look back. That certainly wasn’t my experience. I think that for most people going through grad school today, it’s difficult work, and jobs are difficult to come by. I don’t think you get there unless you have a tremendous amount of persistence to stay with things often when they’re boring, hard, tedious, or when they’re just flat miserable. And I think that persistence has to be fueled by passion. If you don’t have passion for the things you’re working on, I don’t think you can stick with it. Lastly, there’s a big chunk of luck. When you stumble across things that don’t make sense, I think it’s time to stop and scratch your head. Don’t discount them. Check first that you didn’t do something wrong. But when you find things that don’t make sense, you’ve often found a gap in our understanding, and those are the places to really apply the passion and persistence and try to dig into understanding why does it work this way? It shouldn’t, right? Everything I ever learned said it shouldn’t work this way. If that’s the case you should try to figure out why it’s happening there and then see if that’s a general lesson that can be applied to other places. You can learn more about Steve Wondzell and his research on his home page. More information about the HJ Andrews Experimental Forest can be found here. Argerich, A., Haggerty, R., Johnson, S.L., Wondzell, S.M., Dosch, N., Corson‐Rikert, H., Ashkenas, L.R., Pennington, R., and Thomas, C.K. 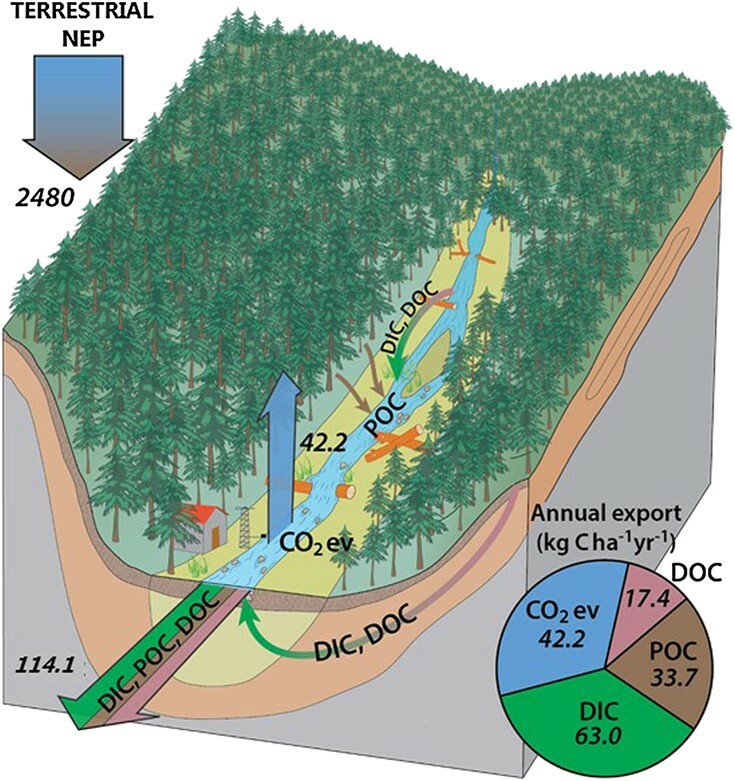 : Comprehensive multiyear carbon budget of a temperate headwater stream. Journal of Geophysical Research: Biogeosciences, 121(5), 1306-1315. DOI:10.1002/2015JG003050, (2016). Wondzell, S. M.: Groundwater–surface-water interactions: perspectives on the development of the science over the last 20 years. Freshwater Science, 34(1), 368-376. DOI:10.1086/679665, (2015). Zarnetske, J. P., Haggerty, R., Wondzell, S. M., and Baker, M. A.: Labile dissolved organic carbon supply limits hyporheic denitrification. Journal of Geophysical Research: Biogeosciences, 116(G4). DOI:10.1029/2011JG001730, (2012). This entry was posted in Hallway Conversations, News and tagged Hallway Conversations. Bookmark the permalink.